Matthew Apgar - mapgar@shawmedia.com Illinois High School Association wrestling referee Blake Vermillion of Crystal Lake expresses himself during a dual meet between Huntley and Jacobs on Thursday, Jan. 14, 2016 at Huntley High School in Huntley. Matthew Apgar - mapgar@shawmedia.com Illinois High School Association wrestling referees Ron Vermillion, right, and son Blake Vermillion, both of Crystal Lake, officiate a dual meet between Huntley and Jacobs on Thursday, Jan. 14, 2016 at Huntley High School in Huntley. Ron has been refereeing for 25 years and his son has followed in his footsteps for 15. 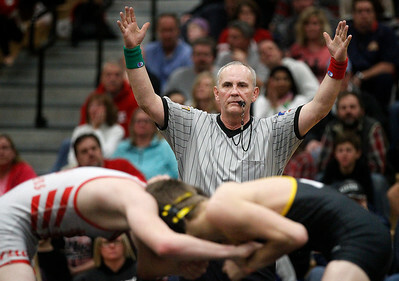 Matthew Apgar - mapgar@shawmedia.com Illinois High School Association wrestling referee Ron Vermillion of Crystal Lake signals for three points for red at a dual meet between Huntley and Jacobs on Thursday, Jan. 14, 2016 at Huntley High School in Huntley. 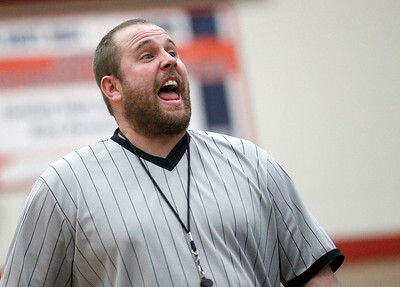 Matthew Apgar - mapgar@shawmedia.com Illinois High School Association wrestling referee Ron Vermillion gestures during a dual meet between Huntley and Jacobs on Thursday, Jan. 14, 2016 at Huntley High School in Huntley. 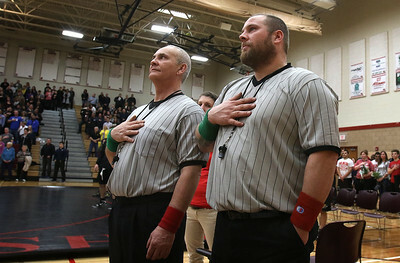 Matthew Apgar - mapgar@shawmedia.com Illinois High School Association wrestling referees Ron Vermillion and son Blake Vermillion, both of Crystal Lake, salute the flag during the national anthem before a dual meet between Huntley and Jacobs on Thursday, Jan. 14, 2016 at Huntley High School in Huntley. Matthew Apgar - mapgar@shawmedia.com Illinois High School Association wrestling referee Ron Vermillion of Crystal Lake watches closely as wrestlers battle it out during a dual meet between Huntley and Jacobs on Thursday, Jan. 14, 2016 at Huntley High School in Huntley. Ron has been refereeing for 25 years and his son has followed in his footsteps for 15. Matthew Apgar - mapgar@shawmedia.com Illinois High School Association wrestling referee Ron Vermillion of Crystal Lake officiates a dual meet between Huntley and Jacobs on Thursday, Jan. 14, 2016 at Huntley High School in Huntley. 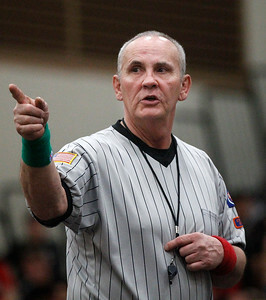 Illinois High School Association wrestling referee Ron Vermillion of Crystal Lake watches closely as wrestlers battle it out during a dual meet between Huntley and Jacobs on Thursday, Jan. 14, 2016 at Huntley High School in Huntley. 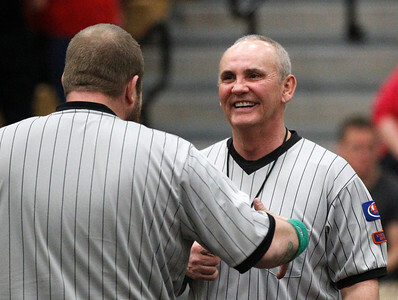 Ron has been refereeing for 25 years and his son has followed in his footsteps for 15.